There is nothing ambivalent about Mark Blyth’s view of austerity: he is against it. 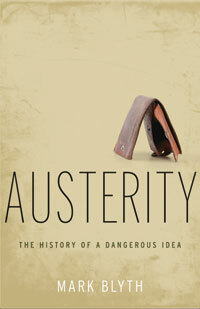 Blyth’s Austerity is more than a brief against today’s accepted form of treatment for all that ails a slumping economy - it is an intellectual history of a powerfully attractive idea, though in Blyth’s view, a dangerous one. Austerity fails for a number of reasons: it is unfair (it hurts the poor), it cannot be pursued simultaneously by all (someone must spend to ignite economic expansion), and (most damning) history shows it doesn’t work. Blyth admits to being a Keynesian. There is no shame in that: many neo-Keynesians are calling for an end to austerity. Blyth states, however, that he need not prove Keynes right (“for what it’s worth, he was right, but that’s in another book”); his goal here is simply to prove austerity wrong. 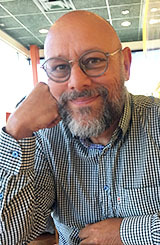 While austerity figures in contemporary U.S. politics, it is predominantly a European fix and fixation, famously imposed on Greece, Spain, Ireland and Portugal as a condition for European and IMF support in response to the Euro Crisis. Blyth begins the book by correcting the dominant narrative: Greece aside, the Euro Crisis did not originate by reckless government spending, but in private irresponsibility. Excessive private sector lending (provoked by cheap borrowing costs associated with the adoption of the Euro) sank the banks in Ireland and Spain (and their respective economies); the states became indebted in attempting to clean up the mess. Setting this history right is important -- as part of the moral authority for the imposition of austerity is a judgment of state fault. Austerity is not merely an economic prescription -- it is a punitive response. As Blyth points out, there was little else Spain or Ireland could have done. Their banks were not only too big to fail; they were "too big to bail" -- that is, their liabilities were beyond the state’s capacities to absorb. Hindsight suggests the better course might have been to abandon the banks -- but that course would have presented other grave difficulties. By shouldered bank indebtedness, several European states wildly exceeded the European limits on budget deficits and overall indebtedness. So why, Blyth asks, is the Euro crisis consistently described as a sovereign debt crisis? One must blame the state in order to justify the imposition of austerity. Austerity well fits the anti-statist agenda. In the name of fiscal virtue, a wide range of social benefits and transfers are slashed: pensions, public salaries, health care, education. The anti-statists have been among us all along; the Euro crisis simply provided an opportunity to implement these wished-for roll-backs as a matter of prudent macroeconomic management. Austerity, the story goes, is the road to recovery. Except austerity hasn’t led to any discernible recovery where it has been applied, at least in Blyth’s review of the economic history. The proposed examples of austerity-generated growth - Ireland and the REBLL group of countries - don’t hold up to critical examination. And there are many more examples where austerity simply made things worse. The unavoidable problem with austerity, Blyth insists, is that it cannot work as a general policy (this is an example of the fallacy of composition). Austerity can work for a country so long as other countries take a different tack: these other countries must spend and expand. But if all countries deflate, the global economy shrinks, perhaps irreversibly. We can’t all cut our way to growth. Austerity limits redistribution - it is precisely those features of the welfare state that protect the most vulnerable that are eliminated in the name of promoting future growth. Austerity then is simply a camouflage for revoking the social pact. And this can be dangerous: Blyth seems alarmed about handgun-toting Americans enraged by increasing austerity in the United States. Blyth provides an account for austerity as an idea. He identifies its various English, Scottish and Austrian sources. But it is the triumph of German ‘ordo-liberalism’ that gives austerity its currency. Germany, after all, is an economic and political success and is a quite ordered place. And in today’s Europe, Germany calls the shots. But Germany’s peculiar success simply cannot be replicated by Spain or Ireland or Greece today; no amount of austerity will convert those economies into export powerhouses. 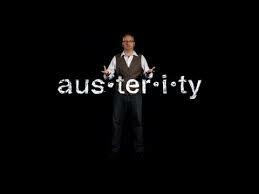 Austerity grew out of Blyth’s brilliant five-minute YouTube video. And much of the bite of Austerity can be found there. But the book deftly shows how this idea, though quite a bad one, captured the imagination of policymakers.